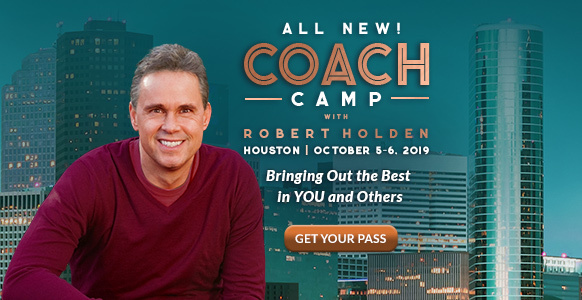 Coach Camp - Houston | Robert Holden, Ph.D.
SOUL-CENTERED COACHING: The highest purpose of coaching is to align yourself with your soul guidance so that you can help your clients do the same. Learn how to recognize soul guidance, listen to your “inner ding” as Louise Hay says, and live your truth. MIRACLE OF SELF-ACCEPTANCE: Tell me one good thing that could happen if you were less self-critical and less judgemental? Together we will do mirror work. I’ll also talk about my work with Dove & the Real Beauty Campaign. MORE OF THE REAL YOU: The next level of success is a dare to be more of the real you! I’ll share inspiration from my Success Intelligence Mastermind, a 6-month coaching journey for experiencing real breakthroughs for success. FOLLOWING YOUR BLISS: Inspiration from one of my spiritual heroes, Joseph Campbell, creator of the Hero’s Journey. I’ll give you a sneak preview of my Hero’s Journey Mastermind, which opens in Spring 2020. YOUR HAPPINESS SET-POINT: I’ll show you how to shift your happiness set-point so that you allow yourself to experience more inspiration, grace and abundance. LOVE-CENTRED COACHING: I’ll share some gems from my 6-month Love-Centered Coaching Mastermind. SPIRITUAL GROWTH & ENNEAGRAM: A practical session on how to use the Enneagram to undo the inner-blocks to your spiritual growth. SAY YES TO MIRACLES: A miracle is a shift you experience each time you choose love instead of fear. I’ll share a key teaching from A Course in Miracles called the holy instant – to help you experience happiness, success, and love in your life NOW! Coach Camp is ideal for YOU if you wish to take a deep dive in your spiritual growth and/or expand your business as a professional coach. I’ve coached CEOs, entrepreneurs, authors, artists, and coaches to raise their game for 25 years now. I love sharing my coaching toolbox to help people live their purpose, heal their relationships, grow their business, and serve the world.